CaseFox® offers tracking important dates and action items. See Docketing/Calendaring. CaseFox® also offers synchronizing calendaring items with external calendars (e.g., Outlook, Google Calendar, Android, iPhone, etc.). See Synchronizing Calendars through iCal Feed Subscription. 1. Login to CaseFoxTM. Visit "Settings/Reports" -> "Calendaring Rules". 2. Setup court/jurisdiction or project type. 3. Add trigger events and then add rules. A trigger even is an event that triggers one or more further deadlines. For example, when a trial date is set in a case, several other deadlines automatically come in play (e.g., discovery must be finished certain days prior to Trial, etc.). Hence, "Trial" may be a trigger and other deadlines can be Trigger Rules. 4. Generally, these additional dates based on a particular event are regulated by state civil procedure, federal civil procedure, local rules, administrative bodies (e.g., IRS), etc. Even though this feature is explained using the example involving court dates, in practice this feature may also be used for other types of scenarios that involve creating multiple events based on a triggering event. 5. If you practice before just one jurisdiction, you need to setup one "Court/Jurisdiction", identify one or more triggering events, various calendaring triggers and for each trigger, one or more trigger rules. Enter days (or time period) in calendaring rules according to civil procedure or local court rules. CaseFox will automatically adjust deadlines for weekends and holidays and create calendar entries for these additional events when associated trigger event is entered in the calendar. For example, if the motion for summary judgment needs to be served at least 105 days prior to trial date (triggering event), just enter "105" "calendar days" "before" in a trigger rule. 6. 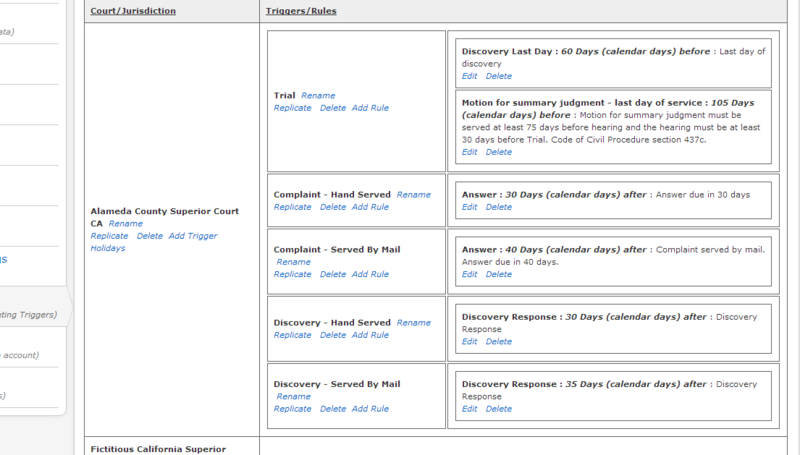 When adding trigger rules, determine if the court rules require counting calendar days or court days. Generally, unless the rule or code specifically states "Court Days", the term "days" means "Calendar Days". Some deadlines include both court and calendar days. For example, in California, a motion notice needs to be served on the other party 16 "court" days before the hearing. However, if the notice is mailed, the rules provide additional 5 "calendar" days. CaseFox can handle these scenarios. 7. Generally, when a deadline falls on a court holiday or on the weekend, the deadline is moved to the next (or previous, if counting backward) court day. When a deadline is counted for court days instead of calendar days, weekends and holidays must be skipped. CaseFox will handle these scenarios. However, you must maintain a holiday calendar (for each court/jurisdiction) in CaseFox (click on "Holidays" link next to the court/jurisdiction name in the list). 8. Check and recheck your calendaring rules and update them when rules change. In "Cases (Projects)" -> "Calendaring" page of a case, a dropdown will show all configured courts/jurisdictions. Assign the case to appropriate court/jurisdiction. Subsequently, when you add a calendaring item for this case, CaseFox will display all triggers configured for the selected court/jurisdiction. 9. Check and recheck dates calculated by CaseFoxTM. This functionality is provided with a full disclaimer of any liability. 1. See Docketing/Calendaring for adding triggering events in your calendar. Based on your trigger rules, automatically created triggered events are added to your calendar (and also to your Google Calendar, if linked with your CaseFox Account). 2. See Synchronizing Calendars through iCal Feed Subscription. iCal feed needs to be subscribed once with an external calendar. Once subscribed, the external calendar will automatically retrieve dates from CaseFox® at regular time intervals. Alternatively, if your account is linked to your Google Calendar, calendaring items will automatically be added to your Google Calendar.